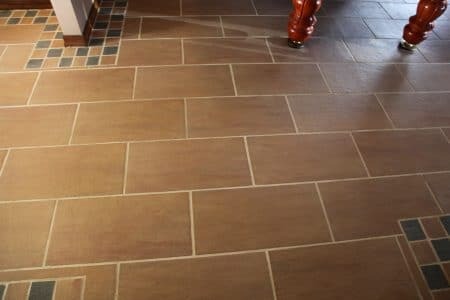 A tiled floor makes an attractive addition to a home or commercial property, and where you have tile, grout is normally part of the installation. Grout lines give it all a uniform appearance with nice straight lines. Sadly, these straight lines don’t always appear totally… clean. Dirt, grime and a range of other contaminants can accumulate through the passage of time and turn a once beautiful floor into one that looks downright ugly. Grout is particularly vulnerable to soil and staining. As with any surface cleaning, a tile and grout floor needs special attention. Keeping it clean after routine maintenance, can help you avoid dealing with heavy-duty issues like restorative cleaning. The following are a few useful tips that can help you keep your tile and grout flooring in excellent shape. First of all, is regular sweeping or vacuuming with a hard-floor tool. Performing this on a daily basis will remove debris, dust and contaminants that eventually become built-up soil. Cleaning and maintaining tile floors are very easy when done properly. Use an approved detergent and a clean mop when cleaning the floor. Some like using the flat sponge mops. The type of tool you choose doesn’t matter as long as it’s used properly and with quality products. Some people recommend using chlorine bleach, which is also a disinfectant. The problem is, bleach can leave a lot of residues that might cause other issues. Apart from being a slip hazard, residues can be tracked across neighbouring carpets, causing colour loss. Use caution, when using bleach of any kind. The most difficult part of Tile & Grout Cleaning is the grout. Grout is porous and even sealed grout lines essentially a little gully where soils settle, get trapped, build up and become an eyesore. Use a quality grout cleaning product from your local tile supplier and be sure to follow the directions. It helps to have a grout brush or stiff brush with long bristles, like a deck brush. Don’t rush, it takes time to do the job right. Apply the product to the grout and let it sit for the recommended dwell time, then scrub – scrub – scrub! If required repeat the process. Continue working carefully until the grout looks great again. When all the hard work is done, make sure you rinse the surface with water or a neutral floor cleaner. Let the floor dry and inspect your work. If you find any areas that require more attention… get back to work! Tile and grout cleaning is no easy task, especially areas that are heavily soiled. When you find your task too much to handle, do the smart thing. Call a Professional Tile & Grout Cleaning Company. After all, it pays to call a pro! Most of us have uttered these words or had this thought before. Maybe because of pet urine in the carpet or clothing from a baby or toddler who had an accident. When these accidents go unnoticed or untreated is when the problems arise. Often, the first time we notice the issue is with our nose. On carpets or surfaces throughout the home, the most difficult step in removing urine odour is often the first. Trying to pinpoint the actual location of the odour. Using your sense of smell can help you find some spots. Likewise, keeping a close eye on the offender until they lead you to their favourite spot can also help. Professionals, like your favourite carpet cleaner, have devices that can detect and locate the exact position of the urine contamination. Your next step is to treat and clean the area. Small spotting machines or absorbent towels with water and a little detergent can remove what’s in the carpet pile. Unfortunately, it won’t remove urine from the carpet backing and underlay where a larger part of the urine often penetrates. This is only something a professional can do. Therefore, any time you can get to a urine spot when it is still damp and blot it up with some paper towel is a great Tip For Removing Urine Odour. After the urine has dried it becomes much harder to remove. If left untreated, particularly when the pet continues the behaviour and more and more urine is absorbed by the carpet, it never really dries out. Urine crystallises and turns into a salt-like substance that attracts moisture from the air. Therefore, urine odours tend to be more noticeable in summer or humid days than they are in winter because winter air is drier. When fresh, normal machine washing should do the trick. You may want to wash them separate from your other garments. If colourfastness is a concern wash with cold water but remember, hot water does clean better. Occasionally, urine odours can remain in clothing due to the contamination age or some other factor. If this happens, pre-soaking will be necessary. Place the contaminated items in a laundry sink, tub or bucket and fill with hot water. Mix a ¼ cup of white vinegar to every 2.5 litres of water you use. Soak for at least two hours. The acidic properties of vinegar will counteract any urine salts that have built up. Urine contamination whether in carpet or clothing while still fresh, is the easiest to remove. Get to it quickly. On carpet, blot, rinse and extract with a spotting machine or absorbent paper towel. 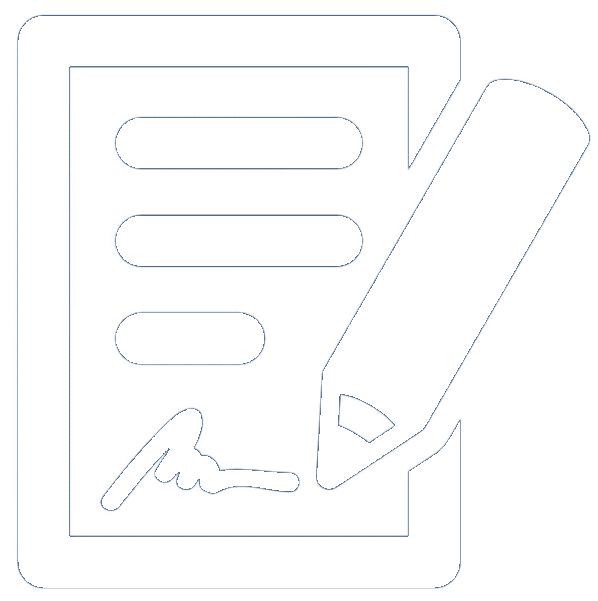 Do not apply products to the area it will likely make things worse, warm water should be sufficient. Don’t get tempted by the products you see in the supermarket. When it comes to clothing, put it straight in the laundry and wash straight away. If odours persist or urine stains and smells are ruining your day, then it’s time for professional help. Don’t delay! Contact your cleaning experts on 1300 399 999 today. After all, it pays to call a pro! Choosing Wool Carpet or Rugs Good Or Bad? 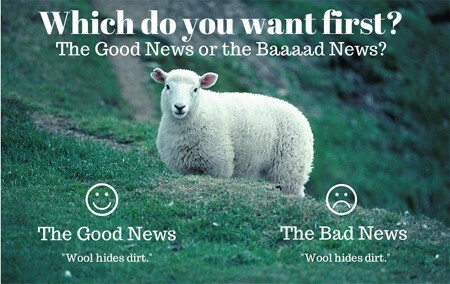 DID YOU KNOW selecting wool carpet or rugs to furnish your home can be good news… and in some cases, baaad? Wool itself is a very high-quality fibre so wool carpet and rugs last longer, look better and retain their value. Some customers are less inclined to choose wool due to its higher price tag. With wool, the majority of dirt on it won’t be visible, and as a result, you may be inclined not to vacuum and clean it as often. This means your lovely, wool carpet or rugs may wear out prematurely. Many consumers set their cleaning frequency based on appearance. This can be very dangerous for a carpet or rug, or all surfaces for that matter. The natural makeup of a wool fibre contains physical characteristics that make it perfect for hiding dirt, particularly the minute, gritty particles that wear out the fibres. You could explain this as setting sand on a sheet of Perspex and walking over it. The sand works like tiny little pieces of glass, damaging the surface. True, wool fibres won’t show damage as fast as other fibres like nylon, polyester or polypropylene. Any kind of dirt or grit on those fibres is bad news. You should discuss with a professional cleaner a plan for frequency based cleaning, not appearance based. Schedule cleaning on a regular basis, and keep in mind that every situation is different. Your home might not need cleaning as frequently as another. This why a professional advice is a wise choice. Yes, choosing wool carpet or rugs can be good, or bad… it depends on how it is treated. 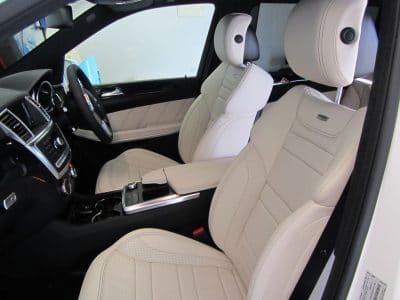 Having the interior of your vehicle professionally cleaned in Melbourne will remove any dust and allergens present inside while leaving a pleasant smell and improving the overall appearance. A neat and healthy environment not only looks and feels good but can also help you think and breath clearer. Have you ever visited a car yard to buy a vehicle? No doubt you would feel irritated if the interior of the vehicle is not cleaned. Car dealers understand, apart from the functionality, the look of the vehicle and its interior can add to a vehicles value. For this reason, a non-smokers vehicle is more valuable. Hiring a professional vehicle interior cleaning company can help preserve the value of your vehicle. Unfortunately, when a vehicle is used regularly especially if children or pets are among the passengers, you might find some unpleasant spots or odours have appeared. Un-maintained leather can suffer scratch marks, and upholstered interiors that are not cleaned for a long time can experience permanent staining or sun fading. Thus, vehicle cleaning can assist you in removing those spots and odours easily. Regular cleaning and protection of the interior of a vehicle can keep it in pristine condition. It can provide a shine to the accessories, leave a pleasant aroma and help maintain its longevity.